What are your main sources of income? One of the most lucrative ways to generate income with the internet is with freelance services. I’m sure you have your favorite list of sites, but you may want to check the following resources. Here are the places where you can be paid to write, divided into levels of writing skills (in my opinion). Here is where you should begin if you are still refining your writing skills. Anyone can register to this site and earn money right away. Choose your favorite topics and start taking opportunities. You can earn $15 per article, as a beginner. This website accepts freelance writers from all over the world. Payment varies from $12 per article up to $50, depending on the quality of the content. That’s a pretty unique concept here. You write your articles and then you can add them into dotWriter’s marketplace. There are different topics, so you can surely find the ones of your interest. For example in the “Internet & Online Business” category, I see an average of $15 per 600/700 words posts. If you are able to write several articles and list them on this marketplace, there’s a chance you can earn some decent money. Good place for finding new opportunities as a beginner writer. You can get jobs related to your skills and interests. Payments range between $7 up to $31 per page of your work. Same concept of dotWriter, also this website is a content marketplace that allows you to sell your articles. There’s a “recently sold” page where you can check the articles just bought from the advertisers. I see an average of $15/20 per 400/500 words post. This is another website you want so sign up in order to get exclusive offers and writing opportunities on a daily basis. Payments are approved twice a month. At the moment of this writing, the highest rate for a job is around $500. Same principles of TopicBay and dowWriter, GhostBloggers is a marketplace where you can sell your high-quality content. Only cons: they just accept native English speaking writers. 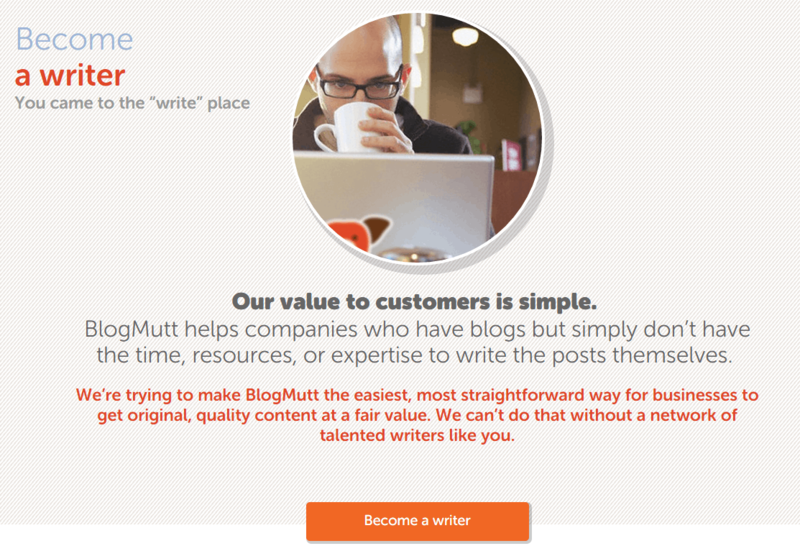 The average pay is $4 per 100 words or $20 for 600 words, but you are free to set your own rate. You can cash out via PayPal once you arrive at $25. Earn money by producing content for advertisers. Freelance writers from over the world accepted. You are free to choose your favorite topics and set the number of articles you are able to write each day. The rates are $4 per 100 words for U.S. people and $3 per 100 words for Non-U.S. residents. This is another website that allows you to sell your articles to different clients. As you write more and become an expert, you will be able to enter the “Writer Pool” in order to get exclusive projects from customers. I see a good average rate at their marketplace, something around 50$ for each article. Remember that Constant Content will take 35% of commissions, so you’ll earn the remaining 65%. Payments via PayPal. Check it out how to register here. Here are the sites for intermediate level writers. This website is awesome and has high-quality content. Here you can submit your list posts, with really interesting facts. You can get paid $100. Here’s the link for your submission. The Dollar Stretcher is a network of publications dedicated to “Living Better…for Less”. If you work as a freelance writer, then I’m sure you are kinda expert about how to save money. They are going to pay you $0.10 per word for any content accepted (this means $100 per 1000 words article). They also look for sponsored posts, so that’s a great opportunity if you want to monetize your website. These folks are looking for articles that explain to their readers how to make money money doing what they more love, writing! Get paid $60 for 600 words or $40 for 400 words articles. Visit this page to read more. This is a content agency looking for hiring freelance writers. Visit this page to apply. First of all, you need to live in U.S. and being legally able to write for a living. It’s a marketplace for crowdsourced content so if you’re a freelance writer, this is a place you want to check to get more work. With more than 100,000 visitors each month and created in 2009, this is an established website you want to write for. The topics are online business, making money online, web traffic, social media and internet marketing. You should be expert in any of this field, before thinking to apply. The rate vary from $50 to $200 per post and payment are made via PayPal. The link for submitting your articles is here. The niche is online business and if your post is accepted, you can get paid $100 via PayPal. Here are the sites for highly skilled writers. About.com is one of the top sites in the world (Alexa ranking at 175 at the time of this writing). 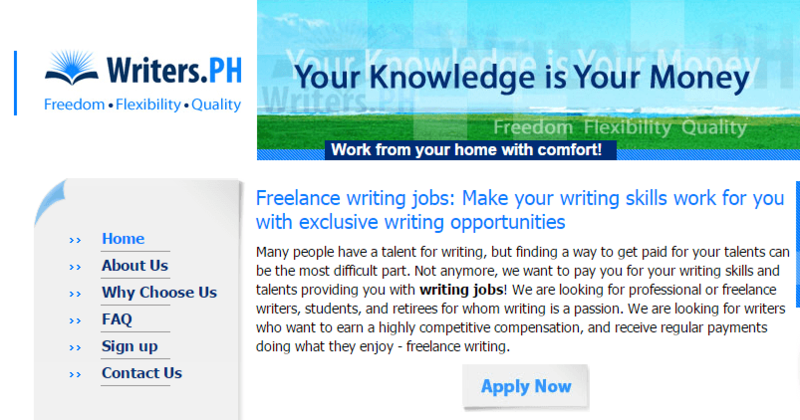 They look for experienced writers, who are an authority in their fields. You need to have developed an impeccable writing skill, before thinking to apply to About.com. Break Studios is searching for writers for their network of popular websites, like Break.com, MadeMan, Holy Taco, Cage Potato, Screen Junkies, and Chickipedia. Also in this case, you need to be a fantastic writer, to be accepted. Here’s the link to check how to apply. This is a very popular and established magazine. They are accepting paid contributions from expert writers. Visit this link to submit your articles to Smithsonian. The topic to write about is general and the amount paid per post is $150. Read more here about contributing for Salon.com. I hope you found some new resources in this list, so to add new websites to get paid for your writing. What’s your experience with the above-mentioned sites? Do you have some new ones to add? And don’t forget to share the content, if you liked it. Nice list, Erik! There’s deff a site or two I hadn’t heard of. Unfortunately Break Studios’ last article appeared sometime in 2012 and they just abandoned everything after that (to the best of my knowledge). I have checked many times since then to no avail. An old site called “Crowd Source” is gaining traction, though. Once you gain access, they present you with a bunch of short tasks (mostly Yahoo Answers style). You can claim or “grab” any job you like from the list and complete it. They also pay the day after approval, so you don’t have to wait a week or a month. Thanks Erik, enjoy your week! Have you tested it? And what about payments? Thanks for adding your list too, Michael. Crowd Source pays, on average, $2.50 per task via PayPal (many of them look like Yahoo Answers-type questions). They usually have no less than 1,000 tasks available (although many of them can’t be written due to how odd the questions are, combined with strict guidelines). Once you reach a certain approval rating and/or complete a certain amount, they increase your level. This allow you to earn $2.75 to $3. or so, depending on your level. I write there once in a while, but not enough to know everything about them. Either way, it’s a decent source to check here and there. Being able to get a long term contract with one of those sites is a great achievement for a freelance writer. I need to check CrowdSource, even if the payment for the tasks is a bit low. Thanks for sharing your experience with us, Michael. This is a very useful resources for writers who want to build a freelance writing career by getting hands-on experience and getting paid for it. I would probably add Infobarrel (earn cash from their IB Ads System) and Bubblews (lots of visitors = cash). I’m not sure how the latter works, but I’ve heard good things about it and that they pay very well, too. Nonetheless, these don’t detract the fact that this a very good post. Will be sharing it on my social media account.. Good job, Erik! glad to see you here and thanks for reading the post. Thanks for adding those resources. I remember to have signed up to InfoBarrel time ago, but never did any business with it. It’s a revenue sharing site, right? You basically write a post, get it published and earn a part of the ad revenue. Going to check right now the other one you mentioned. A very useful resource I must remark! I am not even aware of most of these sources to get paid for writing. Its worth bookmarking. I am going to check out each and everyone of them to see what they offer at real time ;D Moreover, I will like testimonials and reviews on these sites! glad you liked this post, with all the resources mentioned. I used some of the sites listed, and tested their payment. Thanks for checking them out and bookmarking. Thanks for sharing this with us, Erik. Hope you can enjoy the rest of this week! glad you liked the post and the websites for writers mentioned here. Maybe you can try some of the resources in the beginner level, so to make practice! Thanks for checking my article and for leaving your views. Though i am not pro writer i think this will be a useful list for my future use! Nice to know about such a lot of platform out there to help and encourage writers! Thanks Erik for sharing this wonderful list. Of course i will be recommending some of these pages to my online friends and ha may try out for my future use!! I mean I will be sharing this thru my social web pages. Thank you so much for the collection of these platforms. PS: Hey, Erik I found this post curated at kingged and i up-voted it and shared a comment too! Good to hear you are going to save the page for future reference. It’s good to have several places to apply for your writing skills. I appreciate your comment and all the shares. Have a good one, Phil! OMG. Erik, I am a freelance writer, and I can’t help shouting wow over and over again. You just gave me a blank cheque with this. I hope you will get many opportunities, visiting the websites mentioned in this post. This is a huge list of freelance websites information from beginners to mid level, I know only about income dairy website which pays for freelancers. I think this list is very important to bookmark to refer multiple times, thank you very much for sharing the information. I hope it can helps you find more freelance writing opportunities. Good luck with that, Sidiq! Only Few of them name I know, Even I didn’t try those. . Very useful list you share here. Just What any freelancer writer need. Currently my writing skill is at beginning level. 😛 Too became a pro writer I have to polish my writing skill. Bookmarked this post for my future use. we all have to start from a beginner level. With practice, you can improve your skills. Glad you are going to bookmark the page and that you found it useful. Freelancing is becoming increasingly popular because people want to take control of their lives and start their own things. Websites that pay for writing is great ways for freelancing newbies to make some cash and grow their portfolio. I think that people should eventually branch out from using sites that pay for their writing if they want to grow their own business and make more money. The sites that you have listed here are some great sites. Some of them I have not heard of and will have to look more into them. hope you can find some freelance writing opportunities, thanks to these sites. Thanks for checking out the post and for commenting. Good list, let me try with iwriter for no and if i get more orders will focus on other sites too. What you say Erik? From experience, Rekhilesh, the more places you have to find job opportunitie, the more chance you have to build a solid income. If I was in you, I’d try them all. Hope you are going to find some interesting assignments! Ok, let me follow your words. However, I believe I’m not that good in writing. Gonna bookmark it, thanks, I mean it. Glad to have you helped, Shoab! Great list of sites to get paid for writing. I knew only three of the sites mentioned in this post. Will give a try with others. Thanks for sharing this list. it’s good to always try new resources. As a freelance writer, I know that the more websites you join, the more chance to have business opportunities. Bunches of information from this website each and every time, and the great list for freelancer worker and these kinds of information is highly valuable and noteworthy, I bookmarked of this linked. Thanks for shared and enjoyed to reading this post once again! Glad you enjoyed the information, Christina. I just dropped by to tell that I got a little success in my writing job. This article informed me about dotwriter and I tried it few times. I got rejected the first 3 times. But I submitted one more, of course, the previous 3 had taught me a lot. This time, I got it approved. Just wanted to give you a big thank you for letting me know about these sites. One thing I found out, dotwriter doesn’t accept lose writing, they only want solid info written concisely with no grammatical / punctuation mistakes. And if you’d be kind enough to look at that approved article, it’s in the link, hope you don’t mind that I placed it there. Good to hear you are getting a positive experience with freelance writing. Of course, the more you write, the more you become skilled. This is a common practice to follow for everything you want to improve. only earn but also learn in the process. Glad to read you enjoyed these freelance writing resources, Adrianna. Erik, this is an amazing resource for people like me. I started my freelance writing career with a website called i writers, and thought it was the only resource available for freelancers who like to write and make money through it. Let me know if you need any help with those, Sumit. Wow Erik, never knew this whole list of getting paid existed! Thanks for sharing. However, I’m very appreciative of the information you’ve shared here! Thank you so much!